I made the above animated vignette to explain how the health insurance exchanges being established under the Affordable Care Act (ACA), online marketplaces for “shopping” for health insurance, roughly, will work. People will begin signing up for health insurance plans on the exchanges October 1st, and those plans will go into effect Jan 1st, 2014. And any credible fact check will tell you, as this one from the Associated Press does, that the tax credits that fuel the exchanges, that subsidy that will make the now-$20,000-a-year bronze plan cost $5,000 for a family of four in one IRS estimate, will be delivered directly to your insurer. You won’t catch a glance of your tax subsidy. The insurance companies are raising prices through the roof, not only because they’re required to cover much more in terms of minimum health care services, but because they know the government will pay and pay and pay. Thus, sticker shock will put anything but the new-legal-minimum bronze plans out of reach for the vast majority of participants. Pouring cash by the dump truck onto insurance companies is emblematic of our “only in America” health care non-system, and a primary cause of its deterioration. The dump truck-full of unimaginable, astronomical sums of money won’t come from the sky like in my cartoon, it will come from the IRS. The IRS will be in charge of doling out the tax subsidies, and extracting the fines from those who don’t comply with the individual mandate to buy health insurance. I gave a thorough overview of the individual mandate and subsidized insurance exchanges recently: What Is ObamaCare? 2013-2014: Overview Part 1. Though it pains me deeply that the Affordable Care Act doesn’t fix any of the problems within Medicaid, even the most egregious, lethal flaws, I do understand how important the Medicaid expansion is, especially in the Southern states. The Medicaid expansion expands the number of people covered by raising the income threshold for eligibility. That means that families who are severely impoverished, making like $12,000 a year, can now qualify for Medicaid in places they couldn’t previously. like Florida. 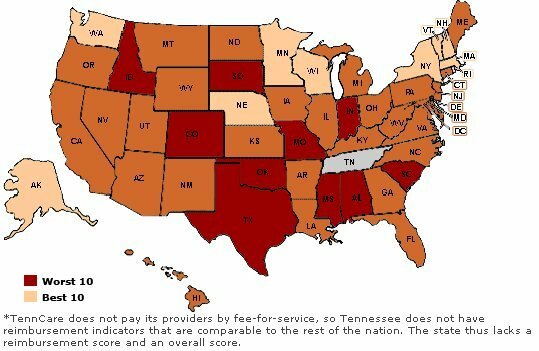 I know that it is hard to believe, but many states, especially in the Deep South, put their Medicaid eligibility thresholds ridiculously low; in Alabama, for example, you can’t qualify for Medicaid unless you make under $251 a month (or thereabouts, it may have changed slightly since I left the state). That means that Alabama Medicaid excludes the working poor, the bulk of all impoverished Alabamians unless they’re children or too disabled to work at all, leaving an enormous swath of Alabamians uninsured and bankrupting the hospitals who provide a great deal of “indigent care.” In Alabama, several rural hospitals have had to close following Medicaid budget cuts that came down from Montgomery, because their patients are mostly not covered, and they’re very dependent on the Medicaid reimbursements they can get for caring for the few rural people who are covered. A recent study published in the New England Journal of Medicine showed that prior Medicaid expansions led to a fall in mortality rates; in other words, expanding Medicaid saves lives. 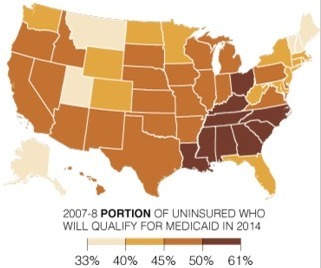 Unfortunately, the states who need the Medicaid expansion the most, i.e. Alabama, are the ones refusing the expansion. Just because this Medicaid expansion is tucked into an amendment of the Affordable Care Act doesn’t mean you’re “accepting ObamaCare” by participating in it. I agree with Chris Christie on almost nothing, but it is important to be fair to everyone. Christie isn’t flip-flopping on ObamaCare, which I explained in Part 1 is all about subsidized private insurance exchanges, he is participating in Medicaid—a state-federal partnership signed into law alongside Medicare by President Lyndon Johnson in 1965—and he’s taking the enhanced match to pay for almost all the tab new eligibles will incur. 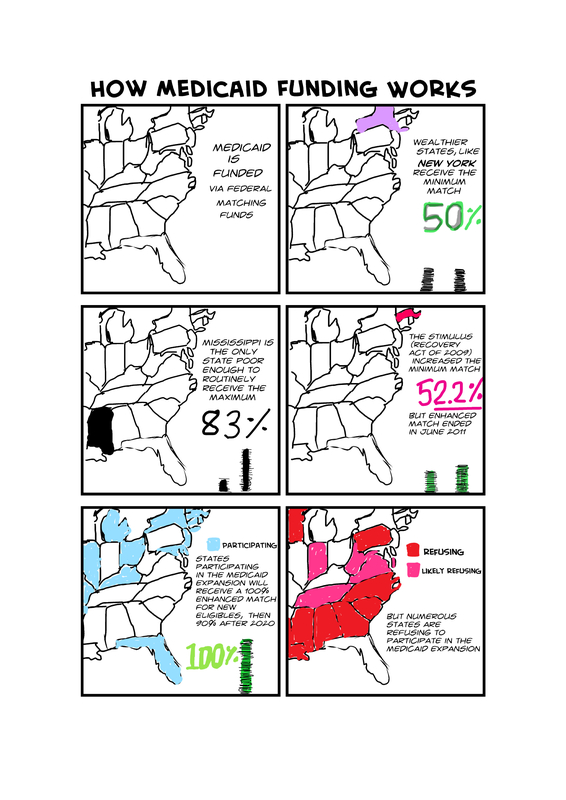 If we’d stop mislabeling governors as “flip-flopping,” maybe more red states would opt-in to the Medicaid expansion; the Southern states need this assistance the most desperately, but are the least likely to take the Administration up on its offer. Oh man, I am so frustrated that people misunderstand ObamaCare—the Affordable Care Act (ACA)—and continually frame it as something it’s not. They frame it as some sort of universal health care coverage, or as some vague new program that replaces Medicare and Medicaid, or at least fixes their most egregious problems (Medicaid’s age 21 cut-off, for example). None of the above are true. I’m writing a book, a memoir of my fight against Alabama Medicaid’s age 21 cut off and a book-length exploration of the plight of young vent-dependent people in general, and if you’re wondering how ObamaCare changes things vis a vis Medicaid, it doesn’t. The Affordable Care Act expands Medicaid eligibility, but doesn’t change the underlying rules and regulations, or fill its most egregious gaps. So there’s very little about ObamaCare in my book; it just isn’t all that relevant for those of us with severe disabilities who have to rely on Medicaid and Medicare. The public needs to ask this over and over again, until the wrong assumptions dissipate. Congress never debated universal health care coverage. When Congress debated the Affordable Care Act, they were debating a proposal nearly identical to a bill titled the “Health Equity and Access Reform Today Act” (HEART Act) which was introduced by Senate Republicans in 1993 as the conservative alternative to Bill Clinton’s health care legislation (which focused on an employer mandate to provide health insurance). The crux of the conservative proposal was essentially, “we want universal health care too, but through private insurance, and we’ll do that through an individual mandate; every American will have health insurance coverage.” The individual mandate means that the government requires individual citizens to have insurance. By 2009, the debate had turned upside down, with Democrats supporting the Heritage Foundation‘s individual mandate as the core of the proposed Affordable Care Act, and the Republicans unanimously against the individual mandate. Inexplicably, Democrats have moved to the right and embraced the rightist policies of the past—Barack Obama has positioned himself as a George H. W. Bush-type of moderate conservative president, a dramatic break from prior black presidential candidates like Shirley Chisholm and Jesse Jackson—and Republicans have turned against their own policies after supporting them for two decades. It’s bizarro world! The costs of the Affordable Care Act. almost all of the costs, come from the individual mandate and the associated subsidies. 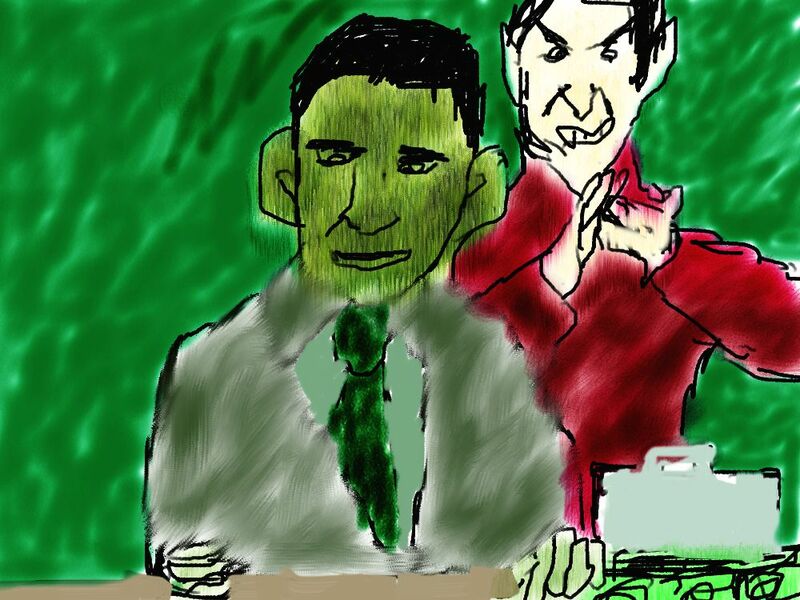 The core of ObamaCare, the nut meat, is the system of subsidized health insurance exchanges. The main idea is that “health insurance is unaffordable and we’ll fix that by adding subsidies that make insurance affordable, and for the poor we will expand Medicaid eligibility, then most everyone will have coverage.” Affordable Care Act proponents called this “achieving universality” by tweaking multiple pieces of the system, like a piecemeal universal health care. This rang hollow even then; it didn’t even sound like the proponents believed their own rhetoric. I didn’t buy the claims that we’d “get to universality” any more than the incredible claims about health care providers voluntarily holding down prices as part of the ObamaCare grand bargain. The debate in Congress over the Affordable Care Act primarily revolved around the individual mandate, the potential costs and red tape nightmares involved, and, inexplicably, abortion. Though the ACA includes a firewall between its subsidies and abortion, there aren’t any abortion-funding provisions in the bill, and the legislation is not intended to address abortion at all, still, the debate centered on abortion to an unexpected degree, in the House of Representatives especially. President Obama signed Executive Order 13535 to reinforce the Hyde Amendment’s prohibitions on federal funding for abortion as related to the ACA. During the 2008 Democratic primary, Hillary Clinton was for the individual mandate and Barack Obama was against it. I agreed with that version of Obama. The idea of requiring citizens to buy a defective product (health insurance scams) from select corporations is terrifying. The U.S. Supreme Court was asked to rule on the question of whether the federal government can require buying insurance and fine citizens for not acting, for non-activity. The court gave the individual mandate a thumbs up, as long as the fine is implemented as a tax. I think that this sets a horrible precedent in terms of the fusion of corporation and state. The Obama Administration, and future administrations, will decide which health insurance plans meet Affordable Care Act standards and are allowed into the insurance exchanges, and as we already have seen, for example with ACA requirements being waived for the most powerful companies, how corrupt that process can be. In 2013-2014 the main provisions of ObamaCare, the subsidized health insurance exchanges—some, like New York’s, will be state-run, but where governors have refused to set up exchanges, for example Alabama, there will be federal-run exchanges—will go into effect, along with the individual mandate. Right now, only two percent of health insurance plans meet the minimum coverage requirements to be sold on the exchanges. We’ll see how things change as the requirements kick in and the exchanges come online (literally, the exchanges will be online marketplaces). Expect to see more than a few kerfuffles over the individual mandate penalty fines, plus some serious sticker shock—the cheapest type of plan under the ACA is a “bronze plan,” and according to an IRS estimate, bronze family plans for 4 and 5 person families are assumed to cost $20,000 a year in 2016—though it seems the exchanges’ subsidies may pay for the bulk of the exorbitant costs. I don’t know that pouring subsidies in won’t just incentivize insurers to keep raising prices. Removing the downward pressure on prices consumers exert when they can’t afford premium hikes, the feds saying “no matter how bad you gouge, we’ll pay it” seems INSANE to me, like something that would only make sense to an industry lobbyist. Massive subsidies that only increase are not a positive, in my view. Neither are subsidies to the health insurance companies amid an abusive dynamic “please stop killing children with preexisting conditions! Here, take $500 billion, just stop hurting us!” a positive; they’re actually the worst possible approach to this problem. And anyone who thinks abusive practices like the cruelty against those of us with preexisting conditions will end, you’re naive; new abuses and new loopholes to get old abuses through will appear on day 1. Awful unintended consequences are already arriving. The entire model desperately needs replacement. 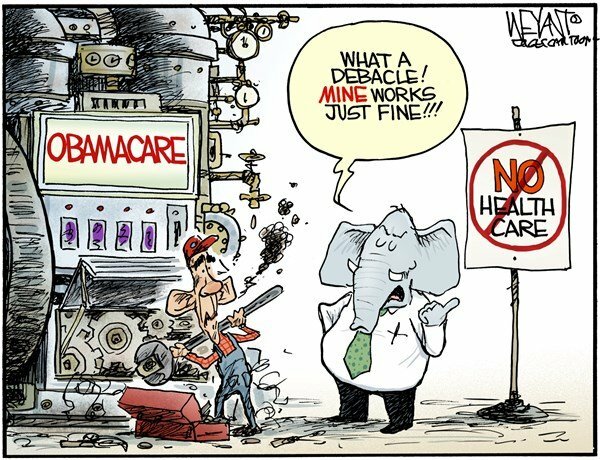 What is ObamaCare? it’s predominately a requirement to buy health insurance from select corporations with fines for disobedience, plus enormous subsidies for those selected corporations. The last statement in the radio segment about my blog was Josie Byzek saying that (my paraphrasing) the Tea Party may win big in the midterm elections, but then there could be a backlash at the ballots in two years (in the 2012 elections). In this Dave Granlund cartoon, poor jobless people with a HELP sign reach out to Uncle Sam, but he just pulls out his empty pockets and says "I was going to ask you the same." We’ll be paying the price for decades for the decision to try and pay for two simultaneous wars with tax cuts and “just go shopping!” and paying for it in numerous ways, some very painful. We gotta pay the piper, and we’ve run up a huuuuuuge tab. If history tells us anything, it’s that the tab is always borne by the poor and disabled, the most vulnerable and least able to pour money into campaigns to fight back. Josie Byzek herself touched on the budgetary realities when mentioning sales tax revenue that helps fund state Medicaid isn’t the same anymore, the bottom fell out. We’ve got *apocalyptic* job loss, the last of the manufacturing sector exiting en masse, etc. Those hardhat-type 9-5 jobs won’t be coming back and you’d have to visit China to see them. The information tech world will be the source of jobs, but it hasn’t adapted and kept up enough to provide that yet, and it may be another lifetime before that happens. This will be a really ugly transition. 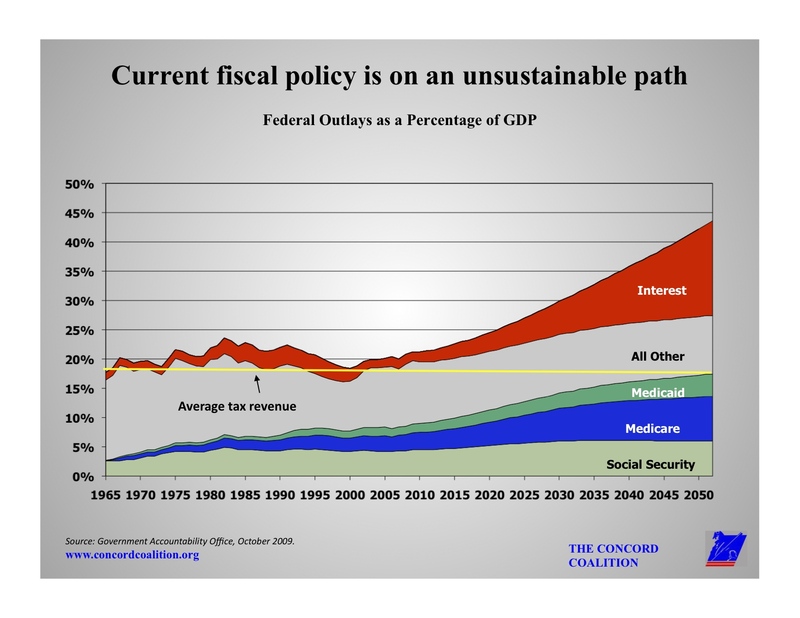 This Concord Coalition graph shows how Medicare, Medicaid and Social Security, in addition to interest on our enormous debt, continue to bloat the budget by % of GDP. In order to sustain benefit spending, we would need to HUGELY grow the economy, but currently, it's shrinking. Terrible choices are coming soon. I’m arguing that technology, the economy, and politics are drastically shifting, and Medicare and Medicaid will soon change BIG TIME, so disability community leaders need to get in front of this and negotiate hard for the services we want to preserve most, because a lot of them ARE going away, and we have to get out of denial and start coping and adapting NOW! Catastrophic institutionalization, re-segregation, will happen unless we acknowledge that economic and budgetary realities mean that a lot of services are inevitably going away and negotiate hard for keeping select services we can’t go without (i.e. HCBS, Home and Community Based Services) using a cost-effectiveness argument. Congress won’t give a damn about us, but will care about cost if we make the case. and y’know how Obama’s health reform bill increases Medicaid eligibility? It gives subsidies to help pay for the increased enrollment, but that enhanced FMAP is temporary. Then what? Then FAIL!! I’ve written about this in detail here; the eligibility mandates will hit the poorest states the hardest and they are already slashing programs to the bone to the extent they’re leaving us in our own waste. Once the eligibility mandates fully take effect in 2014, will the poorest states have to drop most care for people with disabilities? They could have to dump the people most in need, in favor of reshaping their programs to bring them in line with the new requirements, i.e. providing major medical coverage to low-income (able-bodied) adults. This is one of the worst parts of health “reform,” so very disconnected from the needs on the ground and the harsh realities we face. This is a map of the worst and best Medicaid agencies in the U.S., with the reddest being the worst, and the lightest being the best. What I'm telling you is, this map will soon get much, much redder across the country. We can’t afford the COST OF DENIAL. We can’t stay in denial that benefits will be changing; we can’t stay complacent! I’m saying WAKE UP, the societal, technological, economic and political changes are so great that benefits will be changing dramatically, and we aren’t prepared and we aren’t identifying priority areas to protect because there is an unwillingness to sacrifice ANYTHING, so Congress will likely cut EVERYTHING. Failure to get in front of this thing, staying in denial, will mean Congress will just impose 20% or 30% austerity across the board on all departments without understanding the issues involved. My biggest beef with Health Care Reform right now is that we’re building a new tower on top of a broken foundation. Medicare and Medicaid are badly broken, and we’re building more programs on top of that. Bad idea. Insurance company bureaucracy is even worse, but federal programs have to be significantly better in the future for there to be meaningful competition. Right now, the government health care system is still far too fail. Medicaid is deeply corrupt, admitting people to nursing homes because institution owners and their lobbyists line the pockets of state legislators; people are even stripped of home care just for turning 21, and forced into institutions. As far as Medicare goes, its fee schedule encourages procedures over responsible diagnosis and management, causing the death of primary care and creating a costly and disastrous situation for patients. An old man will have no problem finding a cardiologist to do an angioplasty, but may find it near-impossible to find a primary care specialist who can manage him with meds instead. A crude example, but it speaks to how costs can explode when so few primary care docs are around and it’s mostly proceduralists who have survived the extinction. Most new doctors the past few decades have stayed away from family practice because Medicare’s the AMA‘s drastic undervaluing of the E&M (evaluation and management) reimbursement codes make it difficult to survive financially as primary care physicians. You get what you pay for, and Medicare (and the private insurance industry that follows Medicare’s lead) pays for procedures, procedures, procedures, NOT talking to patients and thinking about what’s best for us. According to Medicare, taking a detailed history from a patient is worth nothing more than something like the first 27 seconds of a proctoscopy; I rarely see doctors taking detailed histories anymore, outside of residents in university hospitals who are ordered to do so. Do plenty of docs have to do more and more procedures just to stay afloat and keep their doors open? YES!! Aside from a fee schedule that has buried primary care and incentivized unnecessary procedures, Medicare has also become such an unwieldy bureaucracy that even the most basic functions are drowning in red tape. I am in favor of Health Care Reform and I agree with you that universal coverage and eliminating the abuses that both patients and doctors have suffered at the whim of the for-profit insurance industry must be curtailed. But I also want you to fix Medicare. Medicare is so bureaucratic that expanding it in its current form would be the death knell for primary care physicians and many community hospitals. The arcane methods of reimbursement, the ever expanding diagnosis codes, the excessive documentation rules and the poor payment to “cognitive, diagnosing, talking” physicians makes the idea of expansion untenable. May I give you one small example, Mr. President? I moved my medical office in April. Six weeks before the move I notified Medicare of my pending change of address and filled out 22 pages of forms. Yes, Mr. Commander in Chief…22 pages for a change of address. It is now mid-August and I still do not have the “approval” for my address change. I continue to care for my Medicare patients and they are a handful. Older folks have quite a number of medical issues, you see, and sometimes it takes 1/2 hour just to go over their medications and try to understand how their condition has changed. That is before I even begin to examine them and explain tests, treatment and coordinate their care. Despite the fact that I care for these patients, according the Medicare rules, I cannot submit a bill to Medicare because they have not approved my change of office address. I have spent countless hours on the phone with Medicare and have sent additional documentation that they requested. I send the forms and information “overnight, registered” because a documented trail is needed to avoid having to start over at the beginning again and again. I was even required to send a signature from my “bank officer” and a utility bill from the office. Mr President, I don’t have a close relationship with a bank officer so this required a bank visit and took time away from caring for patients…but I certainly did comply. I am still waiting to hear from Medicare. At my last call they said they had not received yet another document, but when I gave them the post office tracking number, they said it was received after all. They could not tell me when or if they will accept my address change. I have bills stacking up since April and I just found out that they will not accept them if they are over 30 days old. I have cared for patients for 5 months and will not receive any reimbursement from Medicare. The rules state I cannot bill the patient or their supplemental Medicare insurance either. Believe me, Mr. President, I commend you for taking on such a huge task. Please also know that Medicare reform is needed along with health care reform. It seems like the government doesn’t want doctors participating in Medicare, and makes the reimbursements so low and the hassles so high (they can’t even manage a simple change of address without a half-year bureaucratic nightmare) that more and more providers just give up. Yes, this is yet another case of the government’s unfortunate cranial-rectal inversion. Dr. IcedLatte lists more aspects of modern medicine that desperately need to change here. I support a public option in the new health care reform package, but (unlike some conservatives) I realize we already have several widely-used public options, Medicare and Medicaid, that the government runs, and should fix as a core part of health reform. If a new government program just continues the failures of Medicare and Medicaid, that’s not reform. We have to include the CCA in the bill, include a wider adoption of the PROMETHEUS bundled payment system (PROMETHEUS stands for Provider payment Reforms, Outcomes, Margins, Evidence, Transparency, Hassle-reduction, Excellence, Understandability, Sustainability) so that the government’s skewed, guaranteed-to-fail fee for service billing system doesn’t bankrupt Medicare. Don’t build a tower of babel that’s just going to fall. Listen to all the experts, doctors and patient advocates, and FIX MEDICARE AND MEDICAID. I agree (mostly) with this article by David Ignatius, focus on health system reform, not just “health insurance.” We have to fix the foundation or the new skyscraper is going to collapse. Jeff Crowley from President Obama’s Domestic Policy Council came to our NDRN Board meeting this week. I am certain many people on this list know him but this is the first time I’ve seen him. Here is a summary of what he said and how he said it. He certainly confirmed that it is the administration’s intent to offer the initial health care proposal without including long term care. In a very guarded and cautious way he expressed the desire to deal with long term care in the second session of this Congress. He described CCA as ‘one way to deal with it.’ But he also said there were other ways. As I said I never saw him before and maybe he’s always this taciturn. But his comments about CCA were lukewarm at best. Several times he cautioned against ‘high expectations’ and was >generally very flat and careful in his delivery. Others have more experience and insight in this but my impression was that if we are to succeed with CCA the thrust is going to come from Congress and that the administration is being very cautious. 1. The National Association of Protection and Advocacy Systems (NAPAS). .I won the “2003 Advocacy Award” from NAPAS and traveled to Washington, DC to receive the award and deliver an acceptance speech.